Gov. 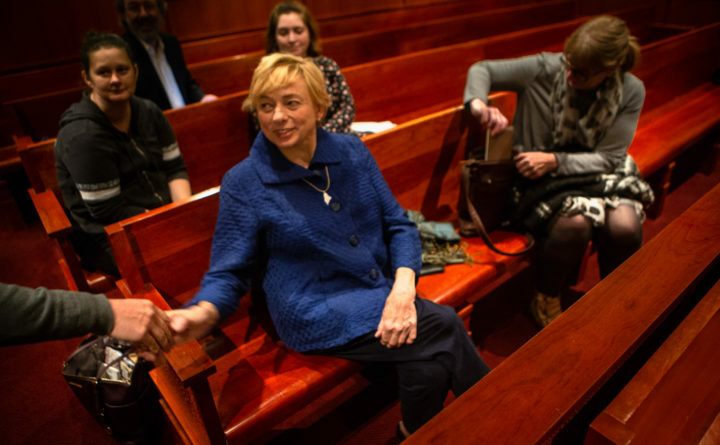 Janet Mills makes an appearance in the gallery of a Portland courtroom the morning of Nov. 7, 2018, where Medicaid expansion was being debated. Good morning from Augusta, where we’re doing an abbreviated Daily Brief today with state offices closed for their final day of the Christmas break. Gov.-elect Janet Mills will be at work, however, and is set to reveal her choice for education commissioner. Whoever it is will be charged with fulfilling a sweeping set of goals from implementing universal pre-K to raising teacher pay. Mills will announce her pick to lead the Maine Department of Education during a noon news conference at her transition office in Augusta amid a large appetite for education reform among the governor-elect and fellow Democrats who will take charge of Augusta in 2019. During her campaign, Mills laid out a relatively ambitious education agenda, which includes the implementation of universal pre-K. While public preschool programs have expanded over the last few years during Republican Gov. Paul LePage’s administration, a stretched teaching workforce has been cited as a potential complication. Mills also wants to increase minimum teacher pay to $40,000, which emerged as a unifying issue among her opponents in the 2018 governor’s race. The new education commissioner will be charged with implementing these goals — and finding a way to pay for them, since the governor-elect has also said she doesn’t want to raise taxes in her first two-year budget. Education has been a bit of a bugaboo for the past two governors. LePage hung his hat on education reform before taking office in 2011. That same year, he won his signature reform by establishing Maine’s public charter school program. But his Department of Education has been marred by little stability in the commissioner’s job, with veteran educator Robert Hasson confirmed last year after the governor cycled acting commissioners in and out of the role. Former Gov. John Baldacci, a Democrat, also famously got a school consolidation plan through the Legislature in 2007, but it was full of escape hatches and while some cities and towns have seen success, it has created divisions between communities and many have backed out of it. Education is a difficult issue to navigate, with lots of conflict between state mandates and the local control that Mainers favor. We’ll soon see what Mills will put at the top of her priority list. — Big changes loom in Maine’s political universe. A new governor will take office a week from today. Democrats will wield greater power in the State House and continue to seek a viable challenger to U.S. Sen. Susan Collins. Meanwhile, Maine Republicans are regrouping as their most charismatic elected leader prepares to leave office and the state. The BDN highlighted six major political stories to watch in 2019. — The incumbent Republican who lost in Maine’s 2nd Congressional District halted his legal challenge to ranked-choice voting. U.S. Rep. Bruce Poliquin announced Monday that he will end his federal challenge to the state’s ranked-choice voting system, which delivered Rep.-elect Jared Golden’s historic 2018 victory over the two-term incumbent. Poliquin’s move ends a lawsuit that threatened to drag out for months in federal court, where there had been little sign that he would ever convince judges to agree with his arguments that the voting system enshrined by Maine voters in 2016 is unconstitutional. — Migrant workers at a Maine wreath company say they were fired after complaining that they had been sexually harassed. Maine Public reports that two investigations are underway after four men and four women who came to Maine from Latin American or the Caribbean reported being fired after claiming they had been harassed by a contractor while working this fall at Worcester Wreath Co. A spokesperson for the Maine Department of Labor said the workers made a complaint to her agency, but she said the allegations are not within the department’s jurisdiction and should be raised with the Maine Human Rights Commission instead. — It doesn’t appear that federal employees forced off the job by a partial government shutdown will return to work anytime soon. On Tuesday, President Donald Trump reiterated his demand that any budget bill submitted to end the shutdown must include funding for a southern border wall, Democrats oppose spending any money on a wall or fence, pushing instead for increased use of technology to control access at the border. The partial shutdown began at midnight Friday, but the impact is likely to intensify today as people begin seeking government services after the long Christmas holiday weekend. Civilized people in the United Kingdom, Canada, other places formerly ruled by England and enlightened European countries are not working today. Instead, they are hunting, shopping, watching sports, jumping into the North Sea or otherwise celebrating Boxing Day. The “second Christmas” observation in these places has always struck me as a humane and rational approach to recovering from the big holiday, even if its roots smack a bit of classism and colonialism. Apparently, what started as a day to honor Saint Stephen and open alms boxes in the Middle Ages morphed into a day to let “the downstairs help” celebrate Christmas a day late after making them spend the holiday serving goose, candied fruit and exotic items encased in aspic to the lords and ladies during the Downton Abbey era. Regardless of its roots, we should embrace the logic of Boxing Day and refrain from working today. Most Maine state offices remain closed today in unofficial observance of “second Christmas.” The federal government is mostly shut down, although for a more Scrooge-like reason. Why not just give up on work today and try again tomorrow? And when our elected leaders do get back to work, how about a bill to make Boxing Day an official holiday for all Americans?